Curiosity about the world is a beautiful part of childhood development. When kids can’t check something out for themselves, they seek answers from the nearest adult. 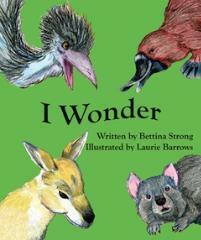 The young narrator of this non-fiction picture book for early-primary or preschool aged children is no different. In I Wonder she asks many of the questions that a small child may pose about Australian fauna, such as ‘what an emu’s egg looks like’ and ‘where a wombat sleeps’. Intended as a springboard for class discussion, the girl asks a single question about the features or behaviour of each of thirteen Australian animals. Strong has included familiar animals such as kangaroos and koalas, as well as some that children may not have encountered, such as a bilby. A brief answer to each question is provided on the inside back cover, although an early reader would need an adult to read and explain these to them. Each double page is brightly illustrated with a colored sketch of the animal in its habitat. Whilst Burrows has drawn realistic animals, facial expressions were added which give the book a fun feel. Although the book has not included a bibliography for further reading, teaching notes and other resources are available from the publisher.